Happy Halloween Source Readers! 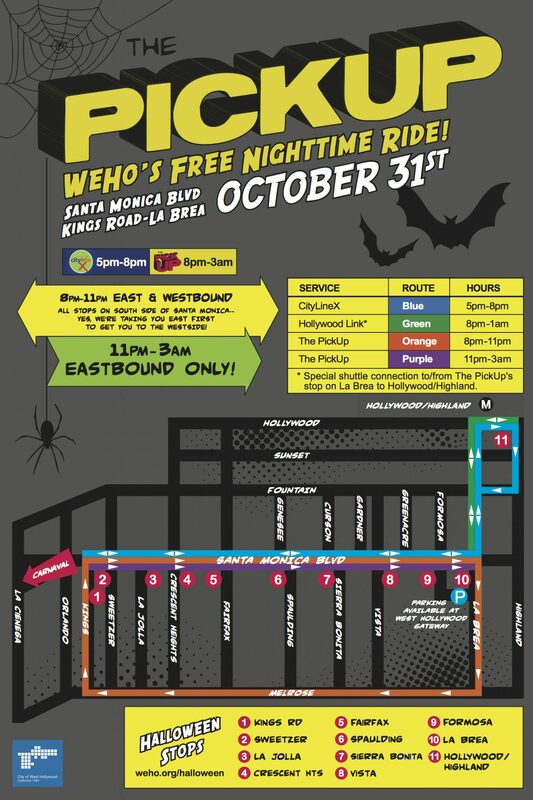 The West Hollywood Halloween Carnaval is back, and due to massive crowds there will be street closures in the area. Several Metro buses will be detouring around the event, but that doesn’t mean there are no transit options to help you reach the Carnaval! CityLineX will run from 5 p.m. to 8 p.m. The Hollywood Link will operate from 8 p.m. to 1 a.m.
Two different PickUp Line shuttles will run from 8 p.m. to 11 a.m. and 8 p.m. to 3 a.m.
Carnaval goers can connect with CityLineX and Hollywood Link at the Red Line Hollywood/Highland Station. For those looking to use Metro buses in the area, please follow the detour signs posted in the area. To plan your best route, see Maps and Timetables or use the Metro Trip Planner. I’m betting I’m going to have the easiest and chillest route there. Metro train to Highland stop and less than a 4 mile bike ride there. No traffic jam at all!